Click on image for link to Scarecrow Press, Inc. 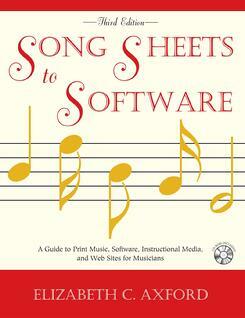 The third edition of Song Sheets to Software: A Guide to Print Music, Software, Instructional Media, and Web Sites for Musicians includes information on the history of printed music and publishing and copyright laws, as well as completely revised and updated listings of music software and other instructional media, web sites for musicians, and technical terms. In addition, Elizabeth C. Axford provides new information on instructional DVDs, book and audio CD sets, and music software programs for teaching everything from children's music to high-end professional recording. The book is divided into 16 chapters by subject matter, such as Music Appreciation; Guitar and Bass; Country, Folk, and Traditional; and Vocal, Choral, Opera, and Musical Theater, offering both related software titles and web sites for each topic. New to the third edition is a CD-ROM supplying Live Links to the sites discussed, as well as an expanded and easily searchable Tech Talk and sample print music scores. The third edition also includes sections on digital sheet music, digital online collections of historical sheet music, video game music, and an updated bibliography. These updates and revisions make this the most complete resource of its kind available.